By 1950, Alco's (Model) 539-engined switcher line had seen 10 years of production. Over this period, only minor changes had been made during production. Among those previously noted were the changes to the radiator shutter assemblies and the addition of exhaust stacks to better prevent exhaust emissions from entering operating cabs. As a final note to Alco's 1950 production line, the switcher line received a modest set of upgrades. The most important was the replacement pf the Blunt truck with the GSC rigid bolster truck, used by all the other builders in their switcher products. In 1949 the AAR adopted this truck as Recommended Practice. In response, Alco followed suit; the 660 hp switcher was designated E1530A, S-3, and the 1000 hp was designed the E1540A, S-4. In addition to the truck change, the S-3 and S-4 body construction was modified to maximize welded assembly and to avoid the use of rivets where possible. Also, rubber moldings were applied to all windows. The end result was a tighter body with less tendency to rattle. Description: Portland Terminal S3 1101, South Portland Maine, May 7, 1984, photo by Chuck Zeiler. Designated as DS-3B by the PT, it had a tractive effort of 49,230, and weighed 196,920. Portland Terminal 1101 was originally built for the Greater Portland Public Development Corporation as 661, then PT 1101 (1958). Description: Portland Terminal S3 1101, South Portland Maine, May 7, 1984, photo by Chuck Zeiler. Apparently, this locomoive was originally built in 1950 for the Greater Portland Development Corporation as #661, and became PT 1101 in 1958. Description: Portland Terminal S3 1101, South Portland, Maine May 9, 1984, photo by Chuck Zeiler. This was the only S-3 on PT's roster. In 1949 the AAR adopted the General Steel Castings (GSC) rigid bolster truck as a Recommended Practice (RP). Alco made some modest upgrades to the S-1, replacing the Blunt truck with the AAR RP truck, designating the upgrade as E1530A, or S-3. In addition to the truck change, more use was made of welded assembly, and rubber gaskets were used for the windows. This locomotive was powered by a six cylinder 660 horsepower McIntosh & Seymour Model 539 normally aspired diesel engine. Description: PTM S3 1101, South Portland, Maine, May 9, 1984, photo by Chuck Zeiler. This location is Rigby Yard, South Portland. Thanks to Larry Hawkes for pointing that out. I didn't know for sure where I was at the time. 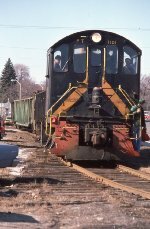 Description: PTM S3 1101, South Portland Maine, May 9, 1984, photo by Chuck Zeiler Here's a comment from Larry Hawkes (thanks, Larry) clarifying this location: That's known as Yard 8 East. It's down to two running tracks today, used mainly for a run-around for cars coming out of the former Merrill Marine Terminal at Yard 8 West in Portland.